As a sound wave travels through the atmosphere, it may scatter from atmospheric turbulence. Energy is lost from the forward moving wave, and the once smooth wavefront may have tiny ripples in it if there is weak scattering, or large distortions if there is strong scattering. A significant amount of research has studied the effects of atmospheric turbulence on the sound wave’s pressure field. Past studies of the pressure field have found that strong scattering occurs when there are large turbulence fluctuations and/or the propagation range is long, both with respect to wavelength. This scattering regime is referred to as fully saturated. In the unsaturated regime, there is weak scattering and the atmospheric turbulence fluctuations and/or propagation distance are small with respect to the wavelength. The transition between the two regimes is referred to as partially saturated. Usually, when people think of a sound wave, they think of the pressure field, after all, human ears are sophisticated pressure sensors. Microphones are pressure sensors. But a sound wave is a mechanical wave described not only by its pressure field, but also by its particle velocity. The objective of our research is to examine the effects of atmospheric turbulence on the particle velocity. Particle velocity sensors (sometimes referred to as vector sensors) in the air are relatively new, and as such, atmospheric turbulence studies have not been conducted before. We do this statistically, as the atmosphere is a random medium. This means that every time a sound wave propagates, there may be a different outcome – a different path, a change in phase, a change in amplitude. The probability distribution function describes the set of possible outcomes. The cover picture illustrates a typical transient broadband event (propane cannon) recorded 100 m (upper plots) away from the source. The time series on the left is the recorded particle velocity versus time. The spectrogram on the right is a visualization of the frequency and intensity of the wave through time. The sharp vertical lines across all frequencies are the propane cannon shots. We also see other noise sources: a passing airplane (between 0 and 0.5 minutes) and noise from power lines (horizontal lines). The same shots recorded at the 400 m are shown in the lower plots. We notice right away there are the numerous vertical lines – most probably due to wind noise. Since the sensor is further away, the amplitude of the sound is reduced, the higher frequencies have attenuated, and the signal-to-noise ratio is lower. The atmospheric conditions (low wind speeds, warm temperatures) led to convectively driven turbulence described by a von Kármán spectrum. Statistically, we found that the particle velocity had similar probability distributions to previous observations of the pressure field with similar atmospheric conditions: unsaturated regime is observed for lower frequencies and shorter ranges; and the saturated regime is observed for higher frequencies and longer ranges. In the figure below (left), the unsaturated regime is seen as a tight collection of points, with little variation in phase (angle along the circle) or amplitude (distance from the center). The beginning of the transition into the partially saturated regime has very little amplitude fluctuations and small phase fluctuations, and the set of observations has the shape of a comma (middle). The saturated regime is when there are large variations in the amplitude and phase, and the set of observations appears to be fully randomized – points everywhere (right). The propagation environment has numerous other states that we also need to study to have a more complete picture. It is standard practice to benchmark the performance of different microphones, so as to determine sensor limitations and optimal operating conditions. Similar studies should be done for vector field sensors once new instrumentation is available. Vector sensors are of importance to the U.S. Army for the detection, localization, and tracking of potential threats in order to provide situational understanding and potentially life-saving technology to our soldiers. The particle velocity sensor we used was just bigger than a pencil. Including the windscreen, it was about a foot in diameter. Compare that to a microphone array that could be meters in size to accomplish the same thing. Cheinet, M. Cosnefroy, D.K. Wilson, V.E. Ostashev, S.L. Collier and J.E. Cain, “Effets de la turbulence sur des impulsions acoustiques propageant près du sol (Effects of turbulence on acoustic impulses propagating near the ground),” Congrès Français d’Acoustique (French Congress of Acoustics), 11-15 April 2016, Le Mans, France. Ehrhardt, S. Cheinet, D. Juvé and P. Blanc-Benon, “Evaluating a linearized Euler equations model for strong turbulence effects on sound propagation,” J. Acoust. Soc. Am., 133, 1922-1933 (2013). L. Collier, “Fisher Information for a Complex Gaussian Random Variable: Beamforming Applications for Wave Propagation in a Random Medium,” IEEE Trans. Sig. Proc. 53, 4236-4248 (2005). E. Norris, D.K. Wilson and D.W. Thomson, “Correlations Between Acoustic Travel-Time Fluctuations and Turbulence in the Atmospheric Surface Layer,” Acta Acust. Acust., 87, 677-684 (2001). Research Associateship Program administered by Oak Ridge Associated Universities. Left: time series of the recorded particle velocity amplitude versus time for propane cannon shots. 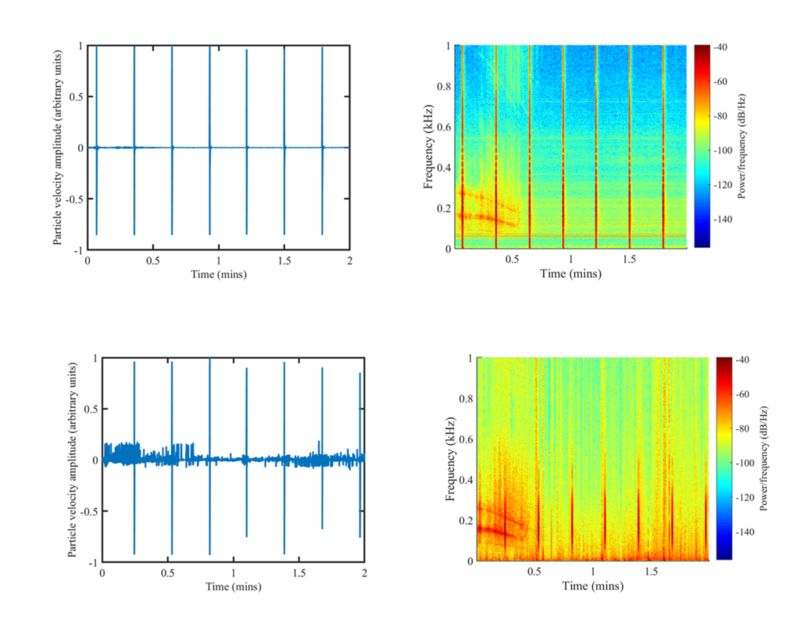 Right: corresponding spectrogram. Upper: 100 m; lower 400 m.
Figure 2 [Collier_fig2_left.png Collier_fig3_center.png Collier_fig3_right.png]: Scatter plots of the particle velocity for observations over two days (blue – day 1; green – day 2). From left to right, the scatter plots depict the unsaturated regime, partially saturated regime, and saturated regime. 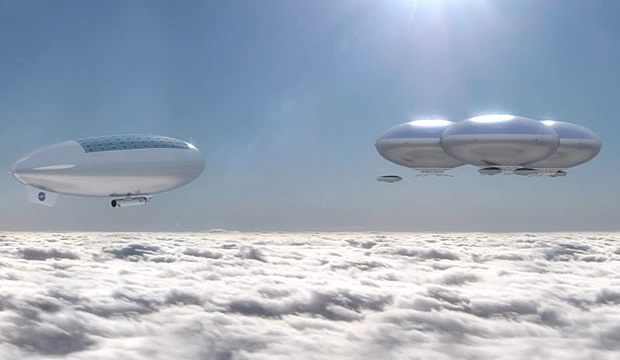 The motivation for this research stems from NASA’s proposed High Altitude Venus Operational Concept (HAVOC), which, if successful, would lead to a possible month-long human presence above the cloud layer of Venus. The atmosphere of Venus is composed of primarily carbon dioxide with small amounts of Nitrogen and other trace molecules in the parts-per-million. With surface temperatures exceeding that of Earth’s by about 2.5 times and pressures roughly 100 times, the Venusian surface is quite a hostile environment. Higher into the atmosphere, however, the environment becomes relatively benign, with temperatures and pressures similar to those at Earth’s surface. In the 40-70 km region, condensational sulfuric acid clouds prevail, which contribute to the so-called “runaway greenhouse” effect. The main condensable species on Venus is a binary mixture of sulfuric acid dissolved in water. The existence of aqueous sulfuric acid droplets is restricted to a thin region in Venus’ atmosphere, namely40-70 km from the surface. Nothing more than a light haze can exist in liquid form above and below this main cloud layer due to evaporation below and above. Inside the cloud layer, there exist three further sublayers; the upper cloud layer is produced using energy from the sun, while the lower and middle cloud layers are produced via condensation. The goal of this research is to determine how the lower and middle condensational cloud layers, affect the propagation of a sound waves, as they travel through the atmosphere. It is true that for most waves to travel there must be a medium present, except for the case of electromagnetic waves (light), which are able to travel through the vacuum of space. But for sound waves, a fluid (gas or liquid) is necessary to support the wave. The presence of tiny particles affects the propagation of acoustic waves via energy loss processes; these effects have been well studied in Earth’s atmosphere. Using theoretical and numerical techniques, we are able to predict how much an acoustic wave would be weakened (attenuated) for every kilometer traveled in Venus’ clouds. Figure 2. 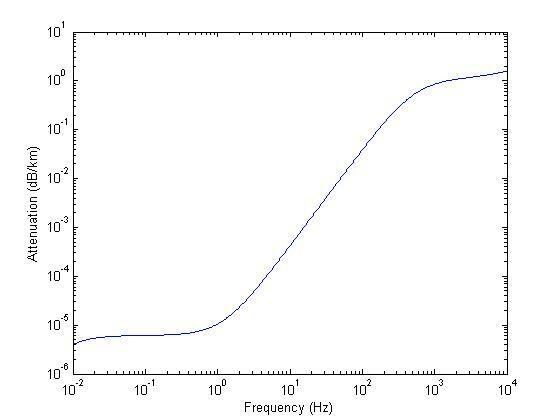 (attenuation_v_freq.jpg) The frequency dependence of the wave attenuation coefficient. The attenuation is stronger at high frequencies, with a large transition region between 1 and 100 Hz. Figure 2 shows how the attenuation parameter changes with frequency. At higher frequencies (greater than 100 Hz), the attenuation is larger than at lower frequencies, due primarily to the motion of the liquid cloud droplets as they react to the passing acoustic wave. In the lower frequency region, the attenuation is lower and is due primarily to evaporation and condensation processes, which require energy from the acoustic wave. For the present study, the cloud environment was treated like a perfect (ideal) gas, which assumes the gas molecules behave like billiard balls, simply bouncing off one another. This assumption is valid for low-frequency sound waves. To complete the model, real-gas effects are added, to obtain the background attenuation in the surrounding atmosphere. This will enable us to predict the net amount of losses an acoustic wave is likely to experience at the projected HAVOC altitudes. The results of this study could prove valuable for guiding the development of acoustic sensors designed to investigate atmospheric properties on Venus. This research was sponsored by a grant from the Louisiana Space Consortium (LaSPACE).